Tourists in Hawaii really like to see dolphins, and that's fine because dolphins are magical (when they're not trying to bad-flipper isolated swimmers or murder innocent tiger sharks), but it's also creating a significant problem: insomniac dolphins aren't getting enough sleep because tourists keep wanting to stare into a sea mammal's soul and suddenly understand all the many thalassic mysteries. Spinner dolphins — whose aerial acrobatics make them a big favorite with dolphin-sycophants — spend most of their days sleeping in the shallow protected bays around the Hawaiian Islands, coming more alive at dusk, which, for all you "Shark Week" devotees, is that magic oceanic hour when sea creatures come alive and murder each other gorily. The problem with this schedule, however, is that it inconveniences all the mouthbreathers from the mainland, who visit Hawaii and embark on a two-hour ocean kayak adventure that involves feeding pterodactyl-sized seagulls whole sleeves of Saltines and chasing sleepy dolphin from cove to cove. As a result of tourists' eagerness to see the very dolphins that Lisa Frank mythologized in her dolphins-jumping-through-the-rings-of-Saturn Trapper Keeper series, spinner dolphins haven't been getting as much sleep as they require, say scientists at Duke and Stony Brook University, which could eventually interfere with their ability to find food, avoid predators and communicate with Aquaman. "Sleep is essential for most animals," explained marine scientist at Duke University David W. Johnston. 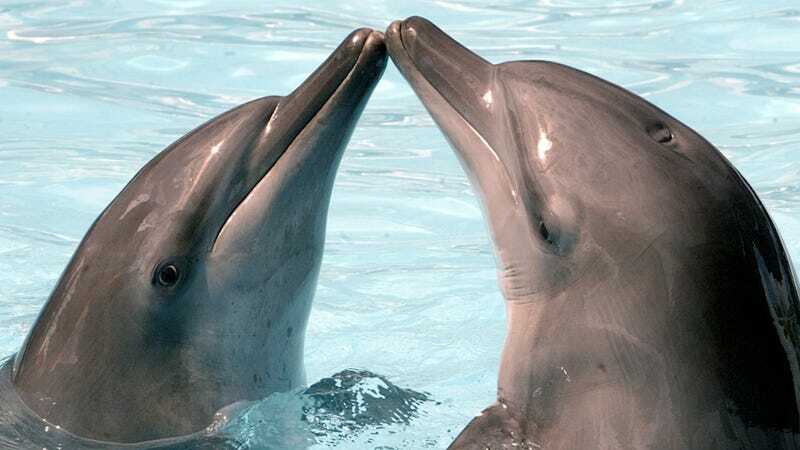 People, in their naive eagerness to maybe pat a dolphin on the head or try to establish some sort of psychic connection starting contest, may actually be keeping dolphins from relaxing, which is really selfish but totally unsurprising considering humans ruin just about everything that's awesome about nature. Boo on us.